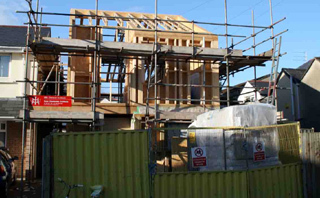 The construction work tentatively began in summer 2006 but had to be abandoned until late autumn due to problematic services connections. A rainwater tank was installed to collect rainwater and use it to flush WCs. 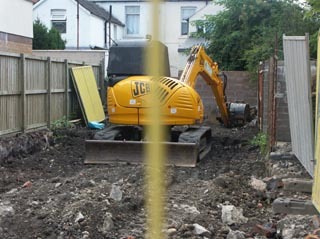 Foundations were dug in the fall of 2006. 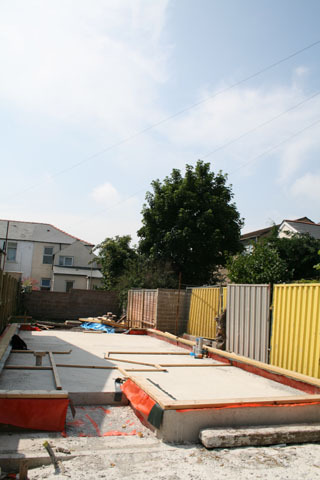 A radon barrier and damp proof membrane is laid under the slab which will provide thermal mass to the ground floor. The slab was cast in January 2007. The timber sole plates are laid spring 2007. 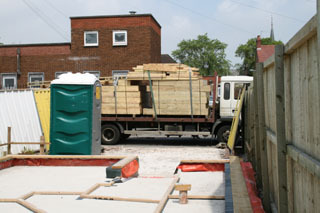 The ground floor panels arrive to site. 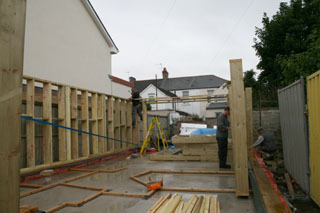 The timber frame panels are installed. 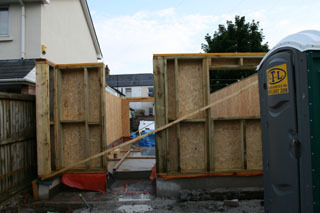 The OSB lining to the timber frame is installed on the inside. 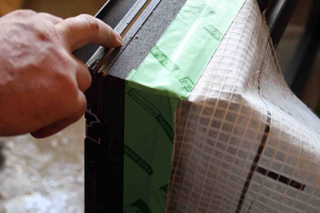 External timber fibre insulation will seal the outside of the panel and create a breathable structure. 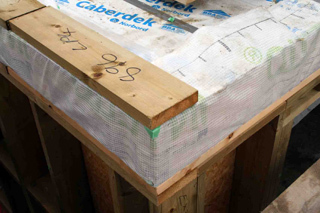 The vapour control layer is wrapped around the outside of the first floor joists to create a continuous vapour barrier and minimise heat loss through infiltration. 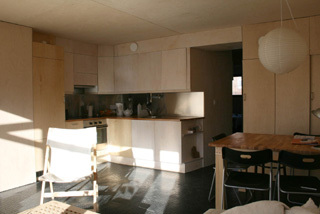 The roof structure allows for the use of the roof space to maximise the living area on the small plot. Hemp insulation was installed between the studs and 80mm of timber fibre insulation was fixed to the outside of the walls with insulated screw fixings. 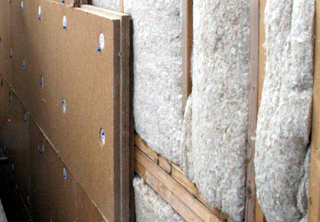 A total of 380mm of insulation was installed in the walls and slightly more in the roof. 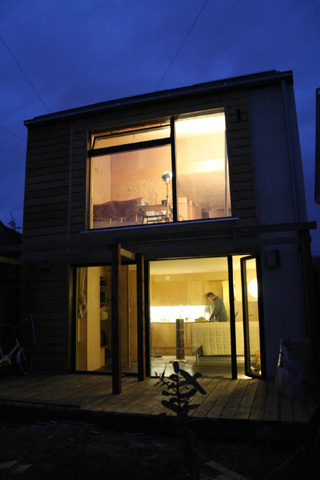 All doors and windows were installed with the vapour control layer taped to the frames. This was then taped to the vapour control on the walls. The roof timbre fibre insulation included a top layer of integral water proofing and did not require a breather membrane. 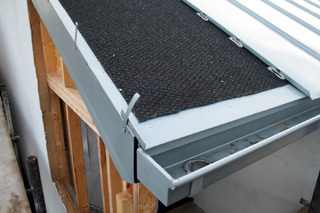 A 50mm ventilation gap was formed and a ply layer was installed to support the zinc metal roof. 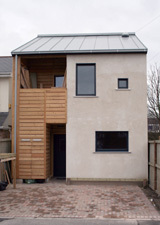 Zinc was used as a roof cover as it can be easily and infinitely recycled. 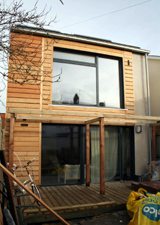 The timber fibre insulation was rendered in places and covered with a breather membrane and timber cladding in other places. The windows are highly insulating with a total (including frame)U-value of 0.7W/sqmK and they comly with the Passivhaus standards. 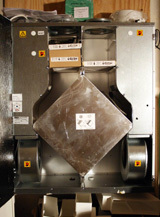 Mechanical ventilation with heat recovery is used to introduce fresh air in a controlled manner and by minimising heat loss. 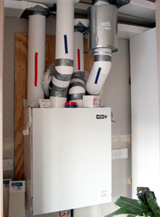 The MVHR recovers over 90% of the heat from the extracted stale air and transfers it to the fresh incoming air. 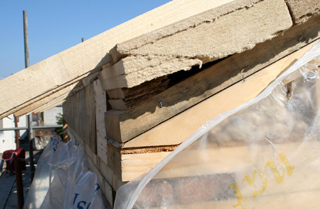 Solar gains and internal gains produce enough heat to keep the homes warm in winter. 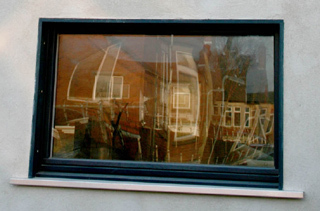 The south facing windows were sized to gain sufficient heat to avoid the need for auxiliary heating. 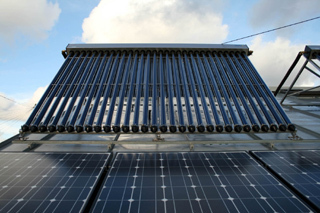 Solar hot water panels were installed to provide 70% of the hot water demand over the whole year. Photovoltaic panels should provide approximately 1000kWhr over the whole year. This is being fed to the ground floor flat. All appliances and lighting are low energy. The electricity to both flats is supplied by a company that generates electricity from 100% renewable sources.